This is about the beauty of Sikkim. The concept of India has been vigorously deconstructed over the past decade by various layers of society. Since the advent of Facebook, the popularity of feminism has become more widespread; many focus on the social rights of women and marginalized communities. Amid a recent waves of patriotism, these concepts have led to lots of debates on various social subjects; however, the truth lies somewhere between the success of the Indian Space program and the killing of humans over the issue of cows. There’s a lot of diversity, some good and some bad, but, all these depend on human nature, which changes across time and space. However, the one thing that you can be guaranteed is the scenic beauty of the seldom-visited North Eastern State of Sikkim. Foreign tourists prefer Goa and Kerala for beaches and Agra for The Taj Mahal, making them practically a cliché. 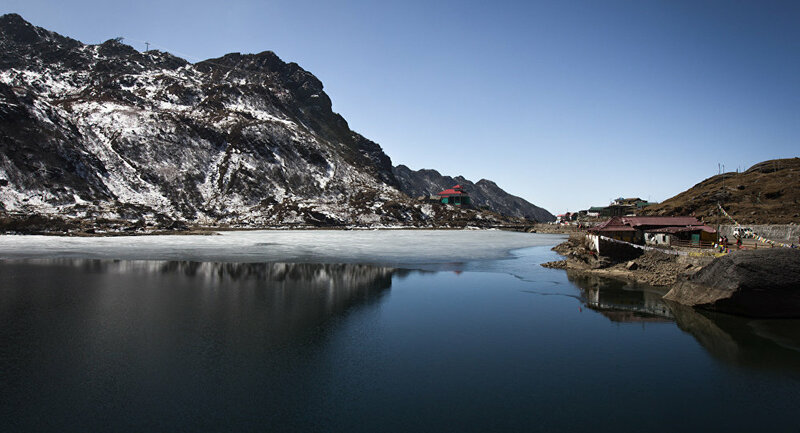 However, if you ever wish to enjoy the serenity of the mountains then Sikkim could be your destination. Once a princely state, Sikkim has got all the echoes that the mountains have to offer. If great heights suit you, the Northern and Eastern parts of Sikkim are highly recommended. The highest point that you would be permitted to travel to under normal circumstances is Lake Gurudongmar (17,800 ft.) in Northern Sikkim, close to the Chinese border. The lake never freezes, even at negative temperatures, and is considered sacred. The roads are mostly great and if you can rent a motorbike, you will have one of the best experiences of your life, provided you don’t have breathing problems at high altitudes. You can see the mighty river Teesta flowing while on the road, but stick to the roads themselves. The Indian Army is your only savior there and the Army does a great job 24 hours per day across the length and breadth of North and Eastern Sikkim, not only in taking care of the border but cleaning roads, as well as rescuing and helping civilians. The other hot tourist destination in the Eastern part are the Nathula Pass (14,140ft), Baba Mandir (13,123 ft) and Tsomgo Lake (12,313ft). The roads are well maintained in this area and amenities are available along the road as well. Ravangla (7,000 ft) on the southern side will welcome you with all its romanticism. It’s a place to have a romantic holiday with your loved ones and family. The greenery, rainfall, and the wispy and foggy clouds in the cool breeze will enthrall and transcend your soul. There are a lot of hotels there to assure a comfortable stay. If you would like to view of the mighty Kanchenjunga (28,169 ft) mountain ranges, Pelling is a great place. The golden morning light on the mountains and its reflection through the clouds will surely have a mesmerizing effect on you. Pelling is known for its romantic vibes, calmness and Kanchenjunga views. The roads here are not as great as they are in Northern, Eastern or Southern Sikkim, but once you view the Kanchenjunga mountain ranges, the bumpy roads won’t bother you anymore. If you prefer big cities but have an adventurous streak which leads you to the mountains, Gangtok, the capital of Sikkim, is the place. It’s clean, well-maintained and a very disciplined city. You can avail yourself to all the trappings of city life while on vacation amid enchanting views. If you ever want to take a break from ordinary tourist hotspots, then a visit to Sikkim is highly recommended. India has 6 seasons and 6 billion outlooks; among India's 1.311 billion people, Sikkim has its own swag.